The Rome Sustainable Food Project, a program devoted to providing organic, local, and sustainable meals for the community of the American Academy in Rome, has launched a delicious revolution to rethink institutional dining. Headed by chef Mona Talbott, a Chez Panisse alum, and guided by Alice Waters, the menus have given rise to a new, authentic cuisine inspired by la cucina romana, Chez Panisse, and the collective experience of those working in the AAR kitchen. 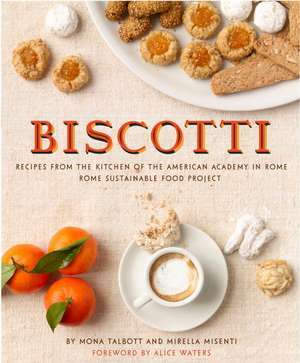 Biscotti is the first book in the series. Each volume, covering a single subject, contains authentic, simple recipes for favorite dishes served at the academy’s communal table, narrated with carefully explained techniques and methods–suitable for both the home cook and the institutional kitchen. Mona Talbott’s first food-related job was working in large reforestation camps in Canada. After culinary school she was hired by Alice Waters to work at Chez Panisse and the Edible Schoolyard program. She later worked at Eli Zabar’s Vinegar Factory and EAT stores in New York. She consulted for Hillary Clinton at her home in Chappaqua, New York. In 1999, Talbott began working for photographer Annie Leibovitz, and in 2004, she was hired by Bette Midler’s New York Restoration Project to design a children’s gardening and cooking program. Since 2007, Talbott has been executive chef at the Rome Sustainable Food Project at the American Academy in Rome. 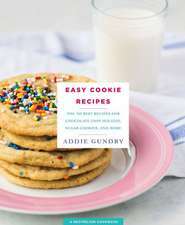 She has published articles and recipes in Saveur, Organic Style, and The New York Times. Mirella Misenti is the pastry chef at the American Academy in Rome. Alice Waters, chef, author, Vice President of Slow Food International, and the proprietor of Chez Panisse, is an American pioneer of a culinary philosophy that maintains that cooking should be based on the finest and freshest seasonal ingredients that are produced sustainably and locally. Waters’s commitment to education led to the creation of The Edible Schoolyard, a model public education program, and the School Lunch Initiative, a national agenda that integrates a nutritious daily lunch and gardening experience into the academic curriculum of all public schools in the United States. She established the Chez Panisse Foundation in 1996 to support the Schoolyard and encourage similar programs that use food traditions to teach, nurture, and empower young people. Her latest book is In the Green Kitchen, available in April, 2010. Matthew Monteith earned an MFA from the Yale School of Art. He has been a Fulbright Scholar and a fellow at the American Academy in Rome. He lives in New York City. Annie Schlechter has been working as a photographer since 1998. Her clients include The World of Interiors, Wallpaper, House Beautiful, Real Simple, W magazine, Travel & Leisure, and many more.